ESA’s Rosetta spacecraft flew by asteroid (2867) Steins on 5 September 2008. Steins was Rosetta’s first nominal scientific target. The spacecraft encountered the asteroid in the course of its first incursion into the main asteroid belt located between the orbits of Mars and Jupiter, while on its way to Comet 67P/Churyumov-Gerasimenko. A European comet-chasing spacecraft will zip by a largeasteroid next month, snapping pictures all the way and potentially unlockingsome of the mysteries surrounding the space rock. 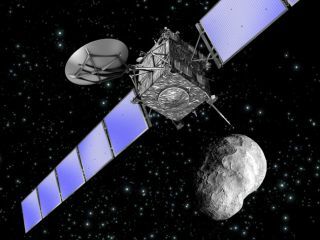 The Rosetta spacecraft, operated by the European SpaceAgency (ESA) is set to glide past asteroid Lutetia on July 10. At closestapproach, Rosetta will come within close to 2,000 miles (3,200 km) of the spacerock. Rosetta has been taking navigational sightings of Lutetia sincelate May so its ground controllers could determine if any course corrections wouldbe needed to achieve the intended flyby distance. In 2008, Rosetta flew by a different asteroid, calledSteins, and a few other space missions have also encountered asteroids.Each encounter has led to different findings, and scientists are hoping thatobservations from the Lutetia flyby will contribute to the relatively smallbody of knowledgeabout asteroids. Currently, not much is known about Lutetia, including whatit looks like. The enigmatic space rock, which is from the main asteroidbelt that orbits between Mars and Jupiter, simply appears as little more than asingle point of light to ground-based telescopes. Preliminary observations suggest that Lutetia's continuousvariation in brightness indicate that it is rotating and has an uneven surface.These observations have allowed astronomers to estimate the asteroid's shapeand size, but their determinations are still varied. Initially, astronomers thought that Lutetia had a diametermeasuring about 59 miles (95 km), and is only mildly elliptical. Yet, morerecent estimates suggest that the diameter could be 83 miles (134 km), with apronounced elongation. Rosetta could provide more conclusive evidence about theasteroid's dimensions and composition ? another area with more questions thananswers. A carbon or metal asteroid? Planetary scientists believe that Lutetia is a primitiveasteroid that was left on the sidelines for billions of years, since no planetconsumed during the formation of our solar system. In fact, most of the currentmeasurements seem to support this hypothesis, placing the asteroid in the'C-type' category, which contains primitive compounds of carbon. Yet, some measurements seem to suggest that Lutetia could bea so-called 'M-type', which would mean that there are metals on its surface. "If Lutetia is a metallic asteroid then we have found areal winner," said Rita Schulz, Rosetta's mission project scientist atESA. Although metallicasteroids do exist, they are thought to be fragments of the metallic coresof larger asteroids that were shattered to pieces. So, if Lutetia is made ofmetal, or even contains large amounts of metal, Schulz stated that thetraditional asteroid classification scheme would need to be revamped. "C-class asteroids should not have metals on theirsurfaces," Schulz said. The data collected from the Rosetta flyby will providevaluable observations for asteroidscience, and will at least give scientists preliminary information that canthen be corroborated through ground-based observations. And, the findings willnot only apply for Lutetia, but for other asteroids as well. For 36 hoursaround the moment of closest approach, Rosetta will be in almost continuouscontact with the ground. The only breaks will come as Earth rotates andengineers have to switch from one tracking station to another. Good contactis essential because the uncertainties in the asteroid?s position and shape maydemand last minute fine-tuning to keep it centered in Rosetta?s instrumentsduring the flyby. "Theskeleton of the operation is in place, and we have the ability to update ourplans at any time," said Andrea Accomazzo, ESA Rosetta spacecraft operations manager. 5 Reasons to CareAbout Asteroids?